The list of national cemeteries contains 131 burial grounds in 39 states, including Puerto Rico and Washington, D.C. They have been deemed as being of national importance by the U.S. government since many of the individuals buried there served their country in one capacity or another or is an immediate family member of someone who did. This way of handling the war dead was inadequate because of the large number of soldiers dying during battle. The government felt these soldiers deserved a more honorable burial because of the sacrifices they made. The first national cemeteries were created as final resting places for Union officers and soldiers who were killed during the Civil War. In 1867, the National Cemeteries Act was enacted by Congress to not only fund these burial grounds, but also to help bury the remains of more than 250,000 Union officers and soldiers who died in battle but did not receive a proper burial. This act was amended in 1872 -- and subsequently in 1873 -- to include all soldiers, sailors, and Marines who died during battle. Over the years, the burial requirements were revised numerous times, allowing not only spouses and dependents of veterans to be buried in national military cemeteries, but also public health service persons and World War II Merchant Mariners, among others. In 1930, the Veterans Administration (now called the U.S. Department of Veterans Affairs or VA) was created by Congress to oversee the benefits and facilities for the growing number of veterans. This entity later oversaw the construction and maintenance of the country's national cemeteries. Today, the VA and its National Cemetery Association compile the list of national cemeteries, categorizing them by individual state. These territories, however, have state veterans cemeteries, which have similar burial requirements to national cemeteries, but may have specific residency requirements. They are run solely by their state government rather than the U.S. Department of Veterans Affairs, however, they may be funded with monies from the VA's State Cemetery Grants Program. What this list doesn't include is a map of specifically who is buried at the cemetery. You will need to have at least the deceased person's last name to find out where he or she is buried. 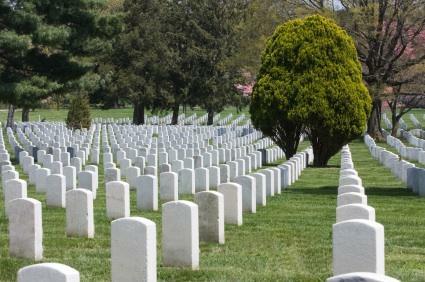 The VA's National Cemetery Association can help you research and locate a national cemetery. The group can also give you information about burial requirements, survivor's benefits, military headstones, and having a funeral with military honors. There is a lot of information and many benefits available for veterans of the U.S. Armed Forces, so take a few moments and find out exactly what is available and what requirements must be met to be buried in a national cemetery.